Door Latch – What Is It? A door latch is a kind of mechanical fastener which is used to affix two (or more) objects or surfaces with each other while enabling the regular or eventual separating with the objects or surfaces. The door latch usually activates a second section of hardware on the other mounting surface area. Based upon the type and design of the latch, this particular engaged piece of hardware could be referred to as a keeper or strike. Remember that a latch isn’t the same as the locking mechanism of a typical window or door, despite the fact that they are often located with each other within the exact same product. What Is A Slam Door Latch? A latch can vary in complexity from flexible one-piece flat springs of plastic or metal, for instance are utilized to hold blow molded plastic-type power tool cases shut, to a multi-point cammed latch utilized to hold big entry doors shut. 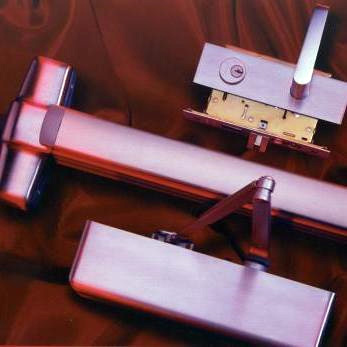 A slam latch utilizes a spring and its triggered through the closing or slamming of the door. Just like any latch, a slam latch is really a mechanism to keep a door shut. The slam latch gets its name from its capability to slam doors as well as drawers closed with no damage to the actual latch. A slam latch is definitely durable and well suited for commercial, agricultural as well as construction functions. What Is A Cam Lock Door Latch? A cam lock is a kind of latch containing a base along with a cam. The base of the latch is the place the key or instrument is utilized to turn the cam, and that is what does the latch. Cams are generally straight or offset; offset cams usually are reversible. Locksets as well as mortise locks are available in mechanical and electromechanical variations. Several of the more complex control systems use electromechanical variations, particularly wherever supervisors would like electronic keypads, card readers or biometric devices to regulate accessibility to a particular area of a building. Anytime it is designed with a built-in or plug-in, full-wave bridge rectifier, the particular devices run on both AC and DC power. The majority of devices function at 12 volts or 24 volts, however some call for 120 voltage. Locksets come with an electrical solenoid which retracts or extends the bolt. Supervisors can easily designate several of these devices to become field changeable from fail safe to fail secure, or visa-versa. 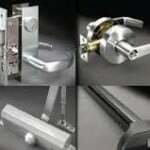 Mortise locks offer outstanding mechanical security. They are ranked for usage in any door, including up to three-hour fire-rated units, so they can be field handed, or simply modified to use on right-or left-hand doors. Several access control systems in commercial, institutional and government buildings have become reader- and computer-based. These kinds of systems have fallen in price, and many are actually network-based. Readers transmit signals or data to processor-based field panels, where accessibility decisions are made. They may be magnetic stripe, proximity, smart card, or biometric readers, or some mix of these. The actual door hardware can become long-term difficulties for many maintenance as well as engineering departments. Regardless of whether keypads, card readers or biometric devices control the doors, the hardware can keep the repairs and maintenance personnel rather busy. Door-position sensors – contacts – are typically secured onto or in the header or framework, and so they perform multiple functions. They indicate the status on the door to security and safety personnel, and they usually interact with the various other security components of the door through the access-control system control logic to instantly re-energize the lock as soon as the door has opened up to make certain it’s secure after shutting. Functionally, these are either mechanical switches or magnetic reed switches, with the latter deemed alot more dependable. A magnetic contact switch features two components. The magnetically operable switch is actually situated inside a glass tube sealed in a plastic or metal housing. This particular assembly will get installed in the header or framework. Once the magnet gets inside a specific range of the switch, the magnetic field closes the switch, completing the circuit. Recessed contacts resist tampering and they are much more attractive compared to their surface-mounted counterparts. But when not installed correctly, they could work their way outside of the cavity, inevitably being sheared off by the closing door. Careless customers may knock-off surface-mounted switches, therefore supervisors need to make sure these types of switches suit the particular application and that also qualified professionals have them installed on the secure side of the door. Manufacturers likewise produce locking hardware using built-in door contacts or switches. These switches typically don’t have the 4- to 6-inch range of their stand alone counterparts, leading to more false alarms. Mechanical ball-type switches are typically maintenance problems, and supervisors ought to stay away from them except if special circumstances call for their use. The latest kind of door switch is actually a part of the hinge and functions on the same reed concept. Its functions are restricted simply because not all types of hinges have got this option. Additionally they may not be as secure as their header-mounted counterparts. The door has to be opened up even further for the circuit to open up. Security and safety personnel typically would want to see a switch circuit open up when the door is open 4-6 inches wide. Where by an electrically operated mechanism is really essential to the door itself, electrical power needs to transfer through the frame to the door. Specifiers may achieve this requirement by utilizing either an electric hinge or a power-transfer device. A electric power door cord is also an alternative solution, however it is often unsightly. These are basically flexible metallic cords by using wiring which affix to the frame on one end and also the door on the other end. Power-transfer devices are usually one of the most dependable, given that they typically don’t help support the door’s weight, and have more substantial enclosures, and utilize larger-gauge wire.